GeekUninstaller helps keep your machine clean and organized by removing more traces left behind by standard uninstalls. Minimalistic interface displays recently installed/modified (since the last run of Geek Uninstaller) programs highlighted purple or orange. Includes support for removing programs that normally resist uninstallation. While a standard uninstall can leave leftovers on your PC, GeekUninstaller performs a deep and fast scanning afterwards and helps remove leftovers. It also includes a Force Removal for stubborn and broken programs. Given this is a portable tool, no installation is required to use it, hence no changes are made to your PC. While the Add and Remove feature from the Control Panel provides you with a quick way to remove programs from your computer, unfortunately, it is not designed to delete obsolete registry keys, temporary files and other junk that usually remains behind following an uninstall. Geek Uninstaller Portable is not only an application that can help you delete apps along with other residues, but it can also lend you a hand with programs that do not uninstall normally. Upon launch, the application populates the interface with the programs that you currently have installed as well as their versions, sizes and the date when you installed them. In the eventuality that you are unsure about a certain utility, then you can use the Google For function to learn more about the software solution or developer. Moreover, you can check out the installation folder for any files that you want to save before removing the tool from Action menu. In case you have dozens of applications installed on your computer or are having a hard time finding the one you want to eliminate, then you will be happy to learn that you can use the search function to find it. Therefore, simply type in the start of the name of the app and the tool displays a shorter list that matches your query. In addition to removing apps, the program also helps you erase stubborn apps that you cannot remove any other way via the Force Removal function. After you delete the app, you can make sure all files the registry entries associated are erased as well. 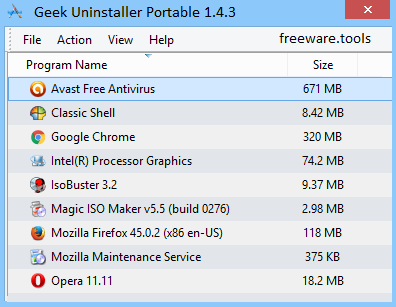 All in all, Geek Uninstaller Portable is an intuitive piece of software that enables you to force remove stubborn apps from your PC as well as clean the associated registry keys securely.